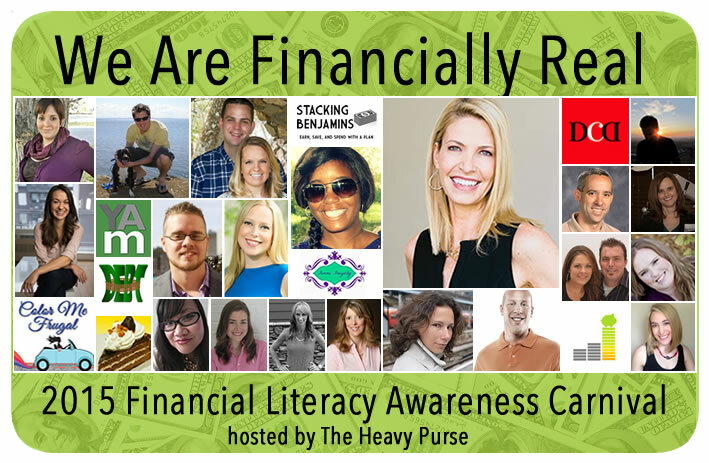 Thanks to Shannon at The Heavy Purse for inviting me to be a part of the 2015 Financial Literacy Awareness Carnival! Financial Literacy is an incredibly important topic and I feel honored to be a part of this event. Thanks so much Shannon! And now read on to hear about our journey to getting financially real with ourselves. I think that many of us here in the personal finance world have experienced moments when we really had to “get real” with ourselves from a financial perspective. Here at Casa Frugal, we’ve found that getting financially real with ourselves has been quite the journey. Rather than one specific moment in time when we “got real,” I think it’s been more of an ongoing process over the course of the last three years or so. There have actually been a series of moments that have led us to where we are today. Here’s how it was: we woke up one day three years ago and asked ourselves how the heck we had let ourselves become so comfortable with such a high level of debt. The amount was really staggering; we owed way more than a year’s income if you took into account both our mortgages (primary residence and a rental property) and student loans. At that moment, looking at our debt, it felt insurmountable. It just really felt like we would NEVER be free of debt. That was, I think, one of the first moments in our marriage when we really woke up and realized that our debt was a major problem. That was our first baby step toward “getting real” financially. But in order to make progress on our debt, not only did we have to accept that we had a problem, we also had to DO something about it. So when we moved to a new state in 2012, we purposefully chose to downsize and purchase a smaller and cheaper house. I think the second moment in our financial journey that helped us to get financially real with ourselves was when we brought our daughter home from the hospital. That’s when it really dawned on us that there are three of us now! If we screw up our finances now, not only are we running the risk of being on the streets eating dog food in our old age, but we also put our daughter’s future at risk. That is the absolute last thing we want to do. And most recently, we had a major financial reality check when we had to come to the difficult decision for my hubby to not take a job that he really wanted in a place that we really want to move to. Unfortunately the job involved a 25% decrease in pay, and in the end we came to the conclusion that at this point in time it is just not financially realistic for us to expect to take a 25% income decrease and still realize our dreams of paying off our debt and financing another adoption within the next few years. It was one of the hardest decisions we’ve ever had to make, but we ended up choosing to stay where we are and annihilate our debt. It was this last experience that really lit a fire under me the most. I mean, we’ve been working toward debt freedom since 2012 (and we have successfully slashed nearly half of our debt in the last three years), but nothing has inspired us to get out of debt quite like our recent experience of looking at something we really wanted and having to turn it down… all (well, mostly) because of debt. In the last few weeks, I’ve been upping my game on side hustles for sure. But most importantly, I’ve decided to go back to work on at least a part-time basis. Being a stay-at home mom for these last few months has been AWESOME, and I wouldn’t trade these last few months for the world. However, right now I think setting our finances straight by dumping our debt once and for all is our biggest priority. We are unbelievably motivated right now- after all, the next time an opportunity like the one that we just turned down comes around, we want to be able to jump on it! I think that sometimes, it’s the most painful experiences in life that you later look back on as a financial reality check. Although our recent experience of having to turn down a great opportunity because of debt was painful, I know that others out there likely have much more painful stories of financial struggle to share. Since we are all human, most of us have made our fair share of mistakes, both financial and otherwise. I truly think that the most important thing about financial mistakes is how we choose to deal with them. We can’t do anything about our past- what’s happened has happened. But we can all choose to work toward a better tomorrow for ourselves. We can choose to increase our financial literacy by reading books, magazines, and blogs. We can choose to take steps like saving money, throwing extra money at debt, having insurance, etc. It is taking actions like these that really encompasses what “getting financially real” means to me. Have you experienced one or more life events that caused you to have to get financially real with yourself? In what way did that change you and your financial priorities? We started getting really “real” when we got pregnant with our second child. Something about having another baby in the way made us get serious! I think kids will do it 🙂 Once we became parents, it really dawned on us that if we screw up now, it’s not just us that will be hurt. And the last thing we would want is for our daughter to suffer at all because of our mistakes. My aha moment was when I realized I was going to lose my home. It really made me stop and start thinking about my financial life and made me want to change. Now that I look back that time in my life was hard but a blessing. I decided to get real when I realized that financial freedom rather than retirement could be an option for me, and once I had a specific goal to work towards, all of the other decisions seemed to be “easy.” If something helps us get to financial freedom faster, then it’s good, if not, we can easily turn it down. Love it! It’s so great to have that clarity and be confident in those decisions. We have had some of those same painful decisions to make, Dee, so I totally get it. It’s hard, but like you said, it’s often (if one will let it be) the catalyst for making true progress on the road to debt freedom. Great post! Thanks Laurie, I sure hope so. We’ve already entered turbo debt repayment mode here and started chucking more money than ever before at our student loan debt. We’ll get there, hopefully in a year and a half or so. “…we also had to DO something about it. ” I’ll bet those actions steps were really tough for you. Especially downsizing at a time when all your friends were moving up. That took some real strength of character…Nice job! I got financially real when I decided that I wanted to spend the rest of my life with my now fiancee. Nobody wants to marry somebody that’s always broke and full of debt… or at least shouldn’t. Aw, that’s so great that she was your motivation. And good for you for working your way out of debt! I think children can really help motivate people to get financially real and clean up their finances. It certainly changed our priorities. The hard part is that kids can also cause us to spend with abandon too. 🙂 It sounds like you made the very difficult, but right for you, decision in regards to your husband’s job. It’s not easy when you realize how debt is holding you back. I think going back to work part-time, whether it’s working from home or not, is a great way to help you eliminate debt more quickly. Thank you for sharing your personal story with us as part of the Carnival this year. I appreciate your support! Thanks Shannon! We are trying hard not to spend without abandon now that we are parents. So far I think we are succeeding, but it’s partly because there are some grandparents around who aren’t showing as much financial restraint and are showering our little miss with lots of stuff. 🙂 So far we don’t mind, but one day when she’s old enough to understand I think we might have to put some limits in place! Having a kid certainly made me think lots harder about the future. You realize that choices you make today are going to affect them now and way down the line. If we’d never had a child, I’m not sure we would have had the motivation to get out of debt. It didn’t seem to matter so much when it was adults only, but I always want to be a good role model and share positive habits with my kiddo. It feels like things are constantly reminding us to stay on top of things. But the realization that Tim’s teeth this year will be $25,000… That really made us focus in and trim a little fat. Not that there was a lot to trim, but there was some that we could do without. I’d just love to have a situation where we actually had the chance to get really lax about money. I think the peace and quiet would be a novel experience. Sigh. Love that last paragraph, Dee. You’re so right, we can’t change where we’ve been, but we’re lucky enough to be able to choose where we’re going. I so often remind myself of that when I am feeling defeated and overwhelmed by our debt. Every step we take in the right direction is one step closer! My finances were always in pretty decent shape, but I got serious about it when I realized how much I hated one of my old jobs. I worked for a nightmare of a boss and I just thought, I can’t do this until I’m 60, that’s insane. That was probably the only good thing that came out of that job, it made me realize that I can shave decades off of the standard “working career” just by prioritizing my finances over other things. Now I get excited for buying new investments rather than buying new gadgets. I think that you made really a great decision to move to another state and to go to a smaller house in order to recover your finances! It takes a lot of courage to do this! Thumbs up! You know, it ended up taking more courage than we thought it would, but mainly because of other people! It turns out that some of our friends and family sort of had an expectation of the type of house that they thought we should be living in, and when we bought a much smaller and cheaper house it led to some awkward encounters at first. Now that we’ve been living here for three years, I think everyone has pretty much gotten used to it. But it was a bigger factor than I initially thought it would be.